Hello there, everyone! It is Andrea here, and today I am so excited to share with you a sneak peek at our brand new collection, "Practically Perfect!! !” It is a magical and gorgeous collection inspired by Disney's new movie, Mary Poppins Returns (and also, the original, 1960’s Mary Poppins). The Mary Poppins movies are classic Disney at its best, full of whimsy, magic, and imagination (not to mention dancing penguins, racing carousel horses, and one extremely smartly-dressed English nanny), and I think “Practically Perfect” is an exciting extension of that tradition. As per usual, along with the fairytale whimsy that I like to bring to all of my collections, there is also a lot of vintage inspiration, and you will see both of those things in the patterns and the embellishments of "Practically Perfect." So get ready to purchase your "Practically Perfect" collection! We will begin taking pre-orders this coming week at some point (after the full reveal), and kits will begin shipping by the beginning of the following week. I hope you have enjoyed this sneak peek, and please stay tuned to see all that our new collection, "Practically Perfect," has to offer to help make all crafty dreams come true! Hello there everyone! It is Andrea here, and today I am so excited to share with you a sneak peek at our brand new, Disney Christmas collection, "Christmas-land!” It is a special event collection that I have created just for our new Fairytale Christmas Workshop that is happening this December on the 21st in southern California (click here for more information about this workshop/class and to purchase a ticket). This specialty collection is inspired by Disneyland at Christmas-time. I don't know about you, but I absolutely love Disneyland at Christmas! They always decorate the park so beautifully for the holidays, and it just seems so perfect and magical! For that reason I wanted to create for you a very whimsical and wonderful collection based on that Disney holiday magic! I am so excited about this collection! If you are a Disney lover, I think that you will find it perfect for all of your Christmas-time papercrafting projects, whether that is decorating in your planner for Christmas-time, doing some handmade Christmas-time decorations, making a Christmas scrapbook or mini album, working on your December Daily, or documenting a special, Christmas trip to a Disney theme park! So get ready to purchase your "Christmas-land" kit! The kit will be available for purchase after the full reveal, which is coming real soon...so stay tuned! For those of you coming to the Fairytale Christmas Workshop, congratulations, this is a sneak peek of the kit you will be getting/working with! Yay!!! I hope you have enjoyed this sneak peek, and please stay tuned to see all that our special event collection, "Christmas-land," has to offer to help make all your Disney dreams come true! Hello there everyone! It is Andrea here, and today I am so excited to share with you a sneak peek at our brand new Christmas-time collection, "December Dreams!! !” It is an incredible and beautiful and magical collection that is inspired by Disney's new The Nutcracker and the Four Realms movie (and also, the original, classic, Nutcracker ballet). The Nutcracker is a classic fairytale story. It is all about a whimsical world of wonder in which a Christmas dream comes alive through dance and music and gorgeous visuals -- like the various lands of sweets, snowflakes, and flowers. In the original ballet, the whole thing starts with a girl and her nutcracker...she starts at a Christmas party with a huge and beautiful tree, and then she goes to a magical place where there are sugarplum fairies and dancing snowflakes! It is truly a Christmas wonderland, a December Dream...and that is the feel that I wanted to bring to this collection! As per usual, along with the fairytale whimsy that I like to bring to all of my collections, there is also a lot of vintage inspiration, and you will see both of those things in the patterns and the embellishments of "December Dreams". I am so excited about this collection! I think that you will find it perfect for all of your Christmas-time papercrafting projects, whether that is setting up your planner for December, doing some handmade Christmas-time decorations (like banners, advent calendars, etc), making a Christmas Scrapbook or Mini Album, or, of course, creating your December Daily to document all the special things that you do each day for the holidays! So get ready to purchase your "December Dreams" collection! We will be sending out the collection/kit to our subscribers this week and the full reveal will also be this weekend, which means that you will be able to purchase your "December Dreams" kit starting this weekend (if you are not yet a subscriber). Yaaaaaaay! I hope you have enjoyed this sneak peek, and please stay tuned to see all that our new collection, "December Dreams," has to offer to help make all your holiday crafty dreams come true! "Tiki, I Love You!" Sneak Peek! Hello! I'm sorry we've gotten a few days behind here on the blog. The bad news is that my health has been very poor, which has made it difficult to get a lot of work done. The good news is that we do have a sneak peek for the next collection to show off!!! It's called "Tiki, I Love You!" and I am in love with it. So excited to finally be able to show some of it to you all! This collection is mainly inspired by the tiki aesthetic (as you may have guessed), and in particular the Enchanted Tiki Room at Disneyland. The colors for the collection are dreamy, pastel pinks and greens, with fresh yellows and blues, as well. It's all about going on that great summer adventure, and it's the perfect collection to help document your summer memories, especially if you happen to meet a mermaid or two along the way. ;) Keep an eye out for the full collection reveal coming soon! "The Wonderful World of Disney" Event Kit Sneak Peek! 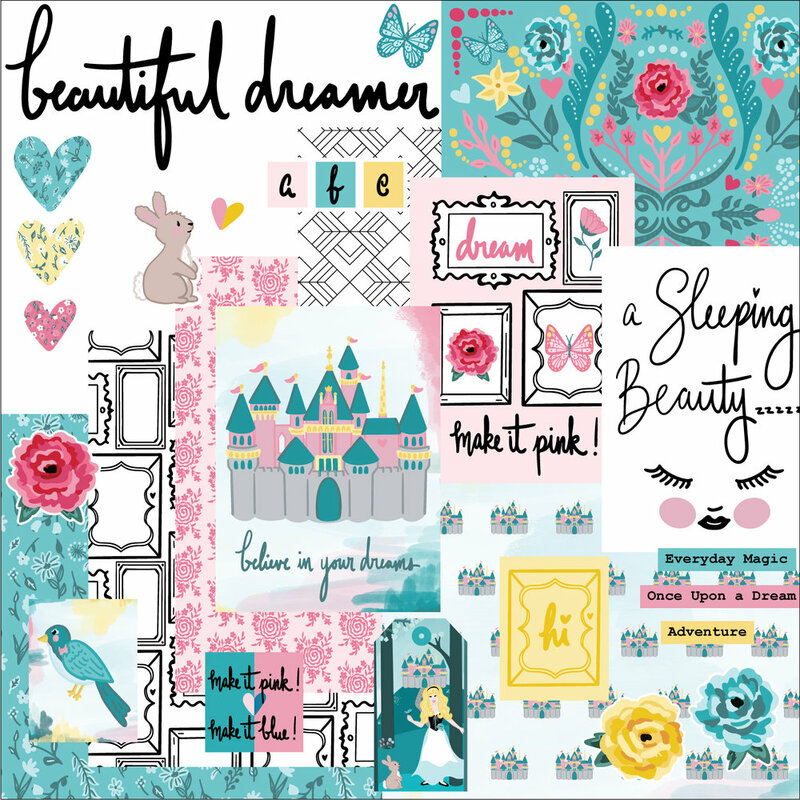 Hello there everyone, it’s Andrea here today and I want to share with you something really special — the sneak peek for our special event collection, “The Wonderful World of Disney”!